Have you ever seen a fixer upper that you knew had a lot of potential but you just didn’t think you had the budget to both purchase it and make it the home you knew it could be? Then I’d like to share with you one of real estate’s best kept secrets (well, maybe not a secret, since it’s been around for years and has put homeownership in reach for many who couldn’t afford it otherwise, but it was new to me until not that long ago). you purchase a home and finance up to $35,000 in renovations and repairs in a single loan. be (plus they give the banks more opportunities to say “no”). Dealing with the FHA may mean that you’ll get a lower interest rate than you would on a regular loan. These loans may also require a lower down payment – between 3.5-10% – than a conventional loan, for better or for worse, depending on your situation. For someone with shaky credit, this may be the way to go, since 203k’s have a lower credit requirement. And since you’re looking at homes that need work, you may be able to negotiate a really good deal, especially when the seller knows it needs work and isn’t willing to put the money into it. Of course, like anything, 203k’s have some disadvantages. First, they can take longer to secure, sometimes up to 45 days. You might also incur costs such as having the home appraised and getting an estimate from an approved lender for the renovations you intend to do. Finally, because 203k’s have safety guidelines, you might have to pay for repairs and improvements you hadn’t planned on (and that aren’t nearly as much fun), such as replacing faulty wiring or removing lead paint. All in all, 203k’s are a good solution for some people, especially those want to purchase a home but can’t afford one that is turn key, as well as for those who really want to create something truly their own. If you think this is for you, talk to your real estate agent. If you don’t have one, or if yours isn’t fully versed on 203k’s, let me know. I can recommend some great ones. 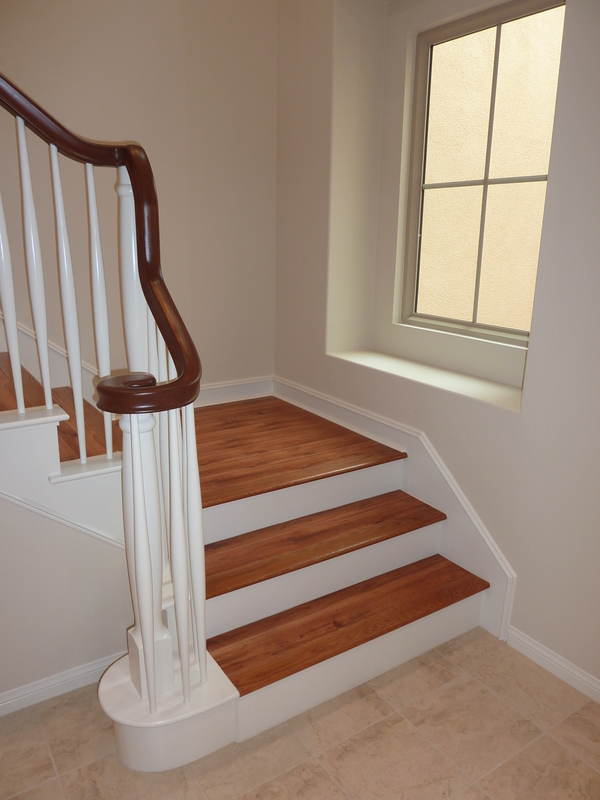 I thought I’d share with you today a staircase we did recently in Irvine – I think it’s just beautiful. 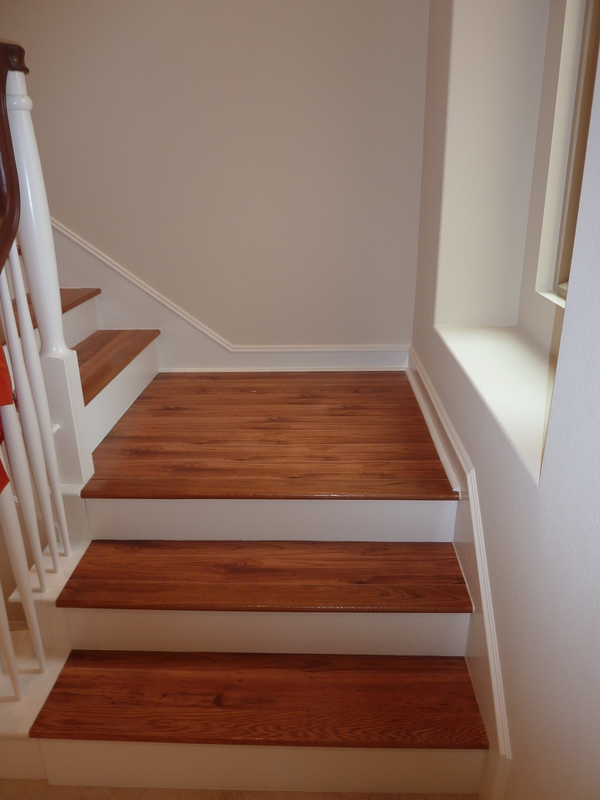 The homeowner had old, worn-out carpeting on the stairs and wanted to pull it out and do something a bit more dramatic, but he didn’t want the expense of hardwood. 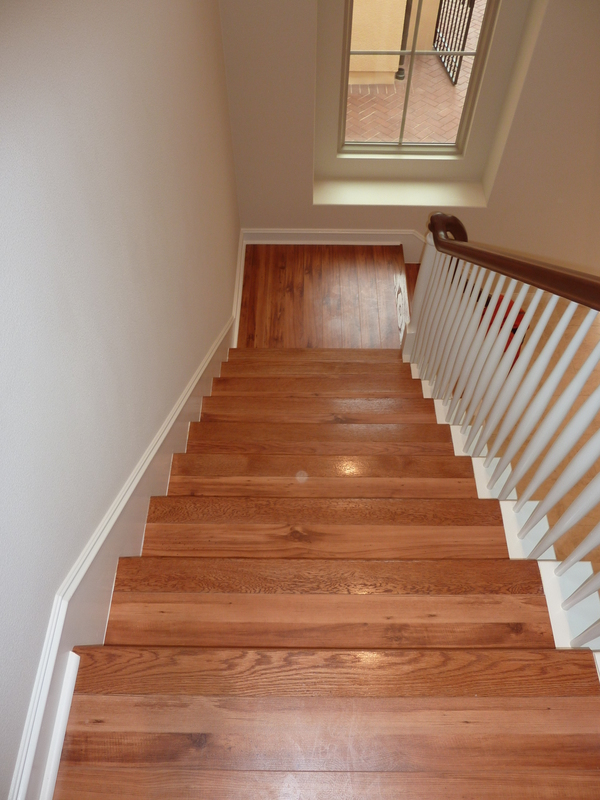 Stairs are a high traffic area, so I often recommend installing laminate, a multi-layered, wood-based flooring system that is strong a durable, resists scratches much better than wood, and can typically stand the wear and tear of kids and pets that would be no match for hardwood. The client chose a rich, 12 mm red ancient pine laminate which we put only on the tread, leaving an elegant contract between the tread and the riser. Beautiful. 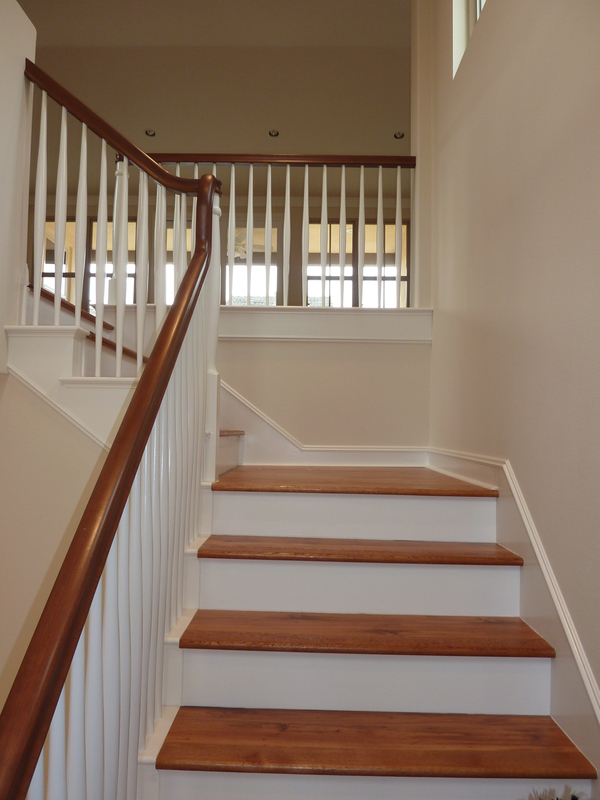 And see how wonderful the stairs look against the wood banister. Cutting the laminate for the treads is hard work, but so worth it. I just love it! Here’s just one more view. More next time about our big Irvine remodel, where some behind-the-scenes electrical rewiring and plumbing is taking place to get ready for the new bathroom and recessed lighting that will go up through the house. Thought I’d spare you the photo of hanging wires and toilet pipes. Stay tuned. 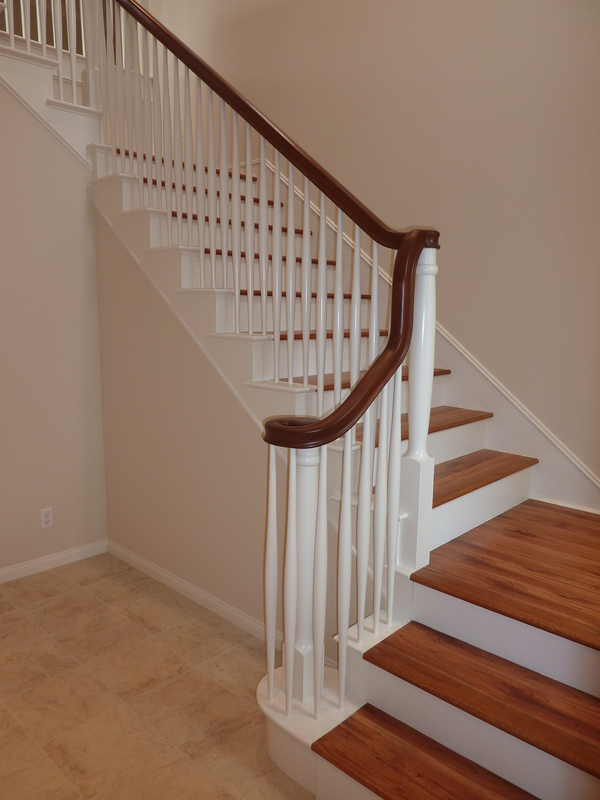 To get a beautiful, durable staircase like the one you see above, contact Doron at 949-279-2011 or doron@edenflooring.com.